Federal President Frank-Walter Steinmeier talking to Stephan Wittenbrink (2nd from right) and Thomas Teritte. Frank-Walter Steinmeier and his wife, Elke Büdenbender met the trainee Muhammed Selmani (right), Managing Director Stephan Wittenbrink (centre) and Site Manager Thomas Teritte in Dortmund. Jan Fiege and Andrea Redenius explained to the Federal President how important it is for Fiege to train and advance young people. Elke Büdenbender asked Muhammed Selmani (left) and Thomas Teritte about the training at Fiege. Dortmund, 26th April 2018. Federal President Frank-Walter Steinmeier paid a visit to the Anne-Frank-Gesamtschule in Dortmund last Friday, 20th April 2018, to learn more about the Starke Nordstadt training project. 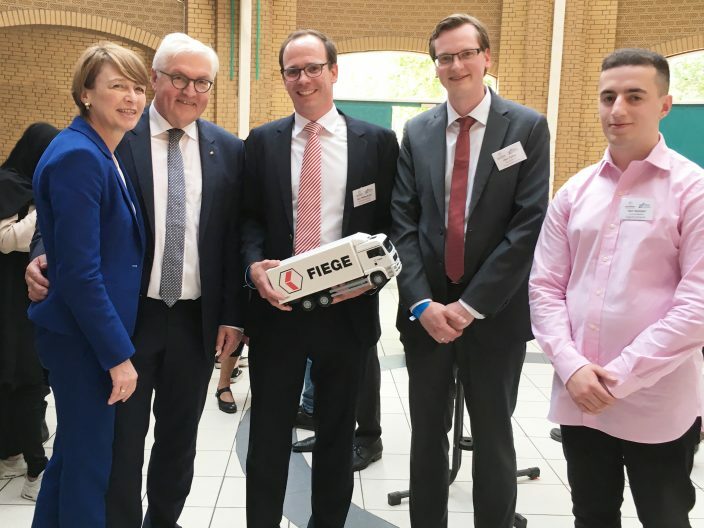 Fiege has been co-operating with the comprehensive school, which is near the tire logistics facility in Dortmund-Lindenhorst, since 2016. 19-year old Muhammed Selmani found a placement with Fiege through this initiative and will take his exam as a warehouse specialist this week. On Friday, Selmani was invited to join the Fiege’s Managing Directors Jan Fiege and Stephan Wittenbrink as well as Dortmund’s site manager, Thomas Teritte with his assistant, Andrea Redenius during the visit of the Federal President and his wife, Elke Büdenbender. 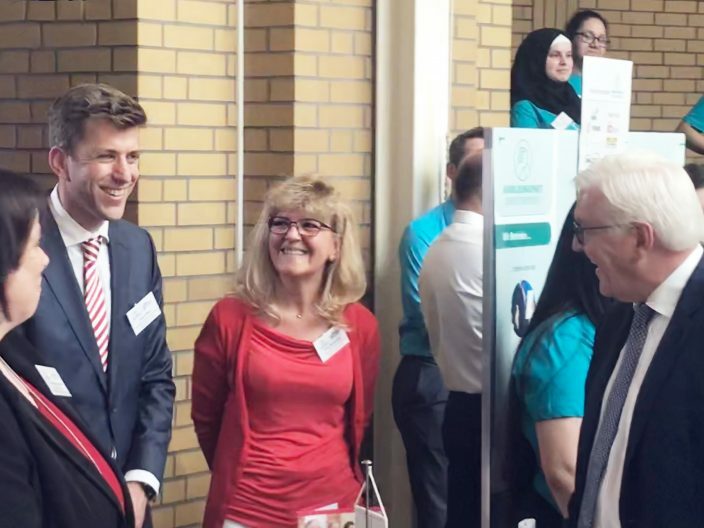 North-Rhine Westphalia’s Minister of Schools and Education, Yvonne Gebauer, and the Federal Chairman of German Trade Unions (DGB), Reiner Hoffmann, also accompanied the Federal President. “We support the school by enabling traineeships and giving students the possibility to obtain additional insight into our operations during a tour of the company. The school, in return, commits itself to making sure that the adolescents obtain a certain level of grades, are not absent without excuse, and pursue a social commitment”, is how Stephan Wittenbrink described the vocational training pact which Fiege and other companies had entered with the comprehensive school and its students. 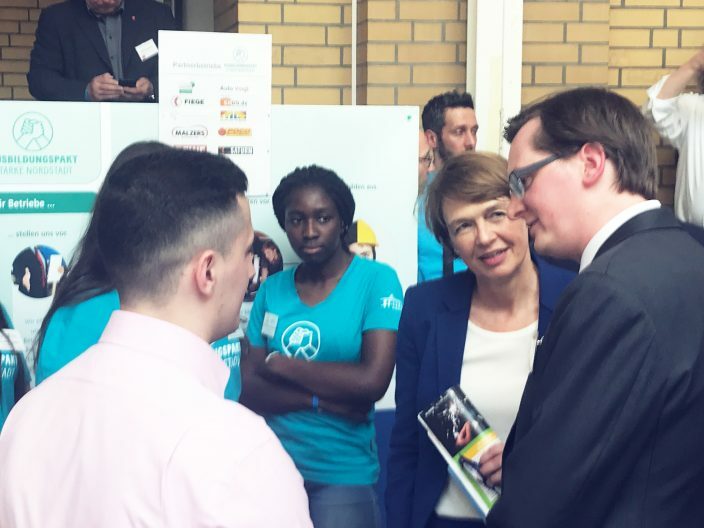 “In the end it is about guiding young people towards a vocational training and giving them a prospect”, explained Jan Fiege to the Federal President during his visit to the Fiege booth. Especially in times that are marked by a lack of skilled workers. 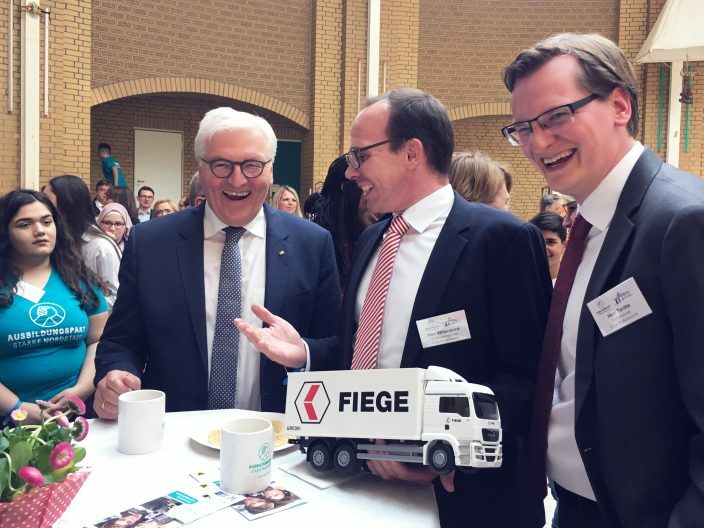 “After all, logistics is an industry which is growing and Fiege is pleased about this”, said Federal President Steinmeier who was gathering information about Fiege and the other ten businesses supporting the vocational training pact of Anne-Frank-Gesamtschule. For Muhammed Selmani, these are exciting days even beyond the talks with the Federal President and his wife: “At the moment my days are filled with learning for my final exam.” If he passes the exam, he will enter his third year of training at Fiege. “I will then be trained as a warehouse logistics specialist”, said Selmani. He enjoys the work: he stores, picks, packs and loads tires of many different sizes. And his coaches are highly satisfied with his work. “Muhammed Selmani is a reliable young man whose development has taken a strong turn over the past two years”, says Andrea Redenius. And the site manager Thomas Teritte adds: “The quality of his work is good. If the development of the business permits, we will want him to stay with us here following his successful training.” Currently, everything suggests that Muhammed Selmani will remain with Fiege for a long time. And the Starke Nordstadt project of Anne-Frank-Gesamtschule will have scored a success.